Tired of long queues at restaurants? 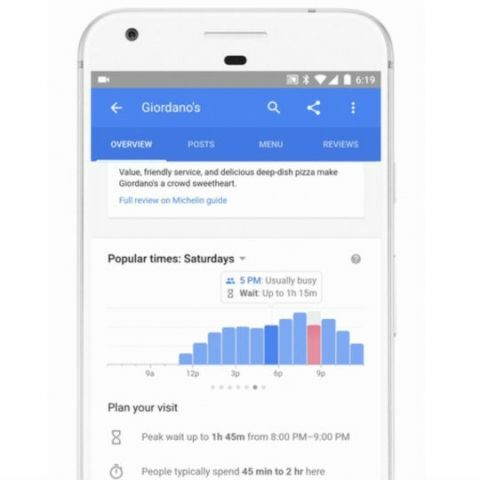 Relax as Google is soon rolling out wait times on Google Search -- followed by Maps -- that will show you the estimated wait-time at your favourite eating hangouts. To see wait times for nearly a million sit-down restaurants around the world that allow walk-ins, just search for the restaurant on Google, open the business listing, and scroll down to the "Popular Times" section. "There, you'll see the estimated wait time at that very moment. And by tapping on any of the hour bars, you'll see the estimated wait for that time period," Google said in a blog post on Wednesday. You can even scroll left and right to see a summary of each day's wait times below the hour bars, so you can plan ahead to beat the crowds. In the case of restaurants, Google will now include a pop-up box that appears when you click on a time frame in the popular times' chart. The box shows the live or historical data labelled as "busy", "usually busy", "usually not busy", etc., along with the wait time, TechCrunch reported.